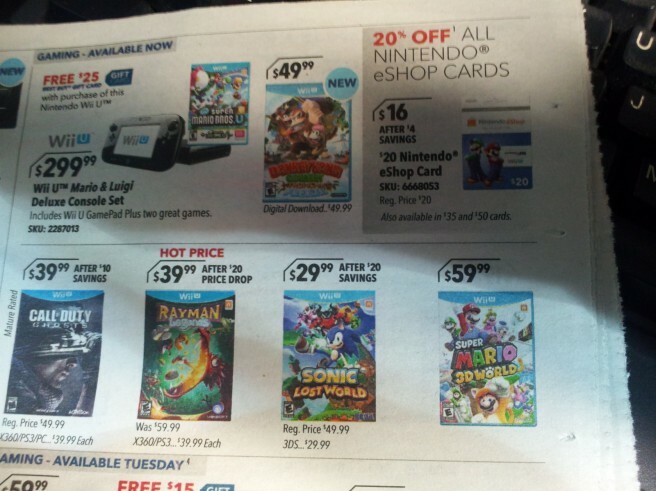 Best Buy will be holding another 20% off sale for eShop cards starting on February 23. Consumers will be able to purchase $50 cards for $40, $35 cards for $28, and $20 cards for $16. The sale will last through March 1. Also worth mentioning, Best Buy will be providing a $25 gift card with the purchase of a Mario & Luigi Wii U Deluxe Set. Sonic Lost World is getting a $20 discount as well for the week of February 23.